An acute Charcot process within a neuropathic foot (often a diabetic patient) arises silently over some months and is often misdiagnosed as cellulitis due to the presence of skin warmth and redness. The process is usually unilateral.However, in contrast to cellulitis, there is usually no skin tenderness, no lymphangitis and the c-reactive protein is normal. This man developed a small wound over a callosity on his left foot 5 months before presentation. He was given multiple course of antibiotic and the wound took 6 weeks to heal. He noted foot swelling at that time which increased further over the next 2 months prior to his presentation to Infectious Diseases outpatients. Dense peripheral sensory neuropathy present bilaterally. Pedal pulses well preserved. 5 degree skin temperature difference between the feet. The photos below show the gross asymmetry between his feet with an early rocker bottom deformity. 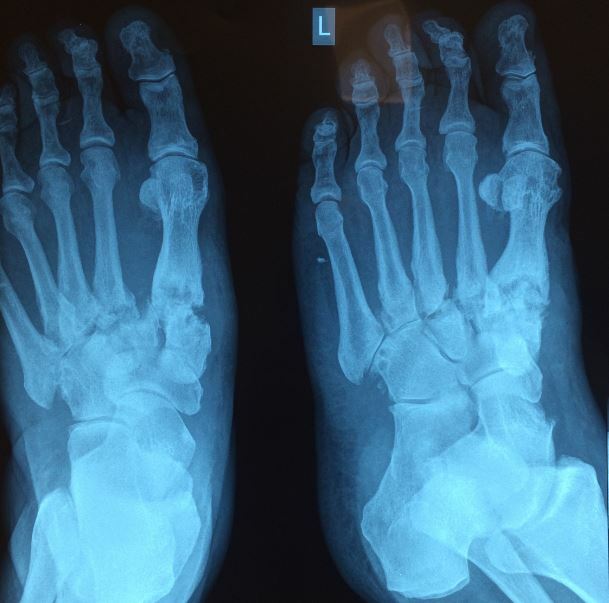 The radiology revealed extensive tarso-metatarsal change. MRI scan showed no significant soft tissue collections nor marrow oedema to suggest osteomyelitis (a major differential). Treated initially with urgent off-loading of the foot was started with a full-time aircast. See this reference for more.